BIG, BIG THANKS to Yogini Tiff for including me in her seven nominations. I’m so very flattered and this really lifted my spirits at a much needed time! 1. I’m perpetually 15 minutes early because I always think I’m going to be late. But I’m always early so I don’t know why I constantly think I’m going to be late? 3. I’m very proactive (see #1) and had a mid-life crisis at 33. 4. I’m a beauty product addict and practically grease myself down from head to toe every night. My future husband is one lucky S.O.B. to get to sleep next to something that resembles a slick seal! 5. I started this blog to work on my trust issues. It might be shocking that I came up with this remedy on my own. It did not come from a certified, scientific therapist. 7. I’m half Japanese and don’t really like sushi. I blame this on a dominant, rogue Caucasian gene that much prefers anything in the form of a potato. Entry filed under: Awards. 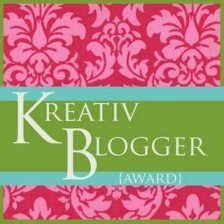 Tags: happiness, kreativ blogger award, Lifestyle, Spirituality, Yoga. Plus, some great new blogs for me to explore. I had a giggle about the beauty product greasing: I do my feet every night obsessively which makes going to the toilet in the middle of the night a bit tricky on our slippy wooden floors. congratulations evolving yogi…love your blog!! Your humor makes looking at some serious problems a little less painful. AND….you are not a jellybean!! !